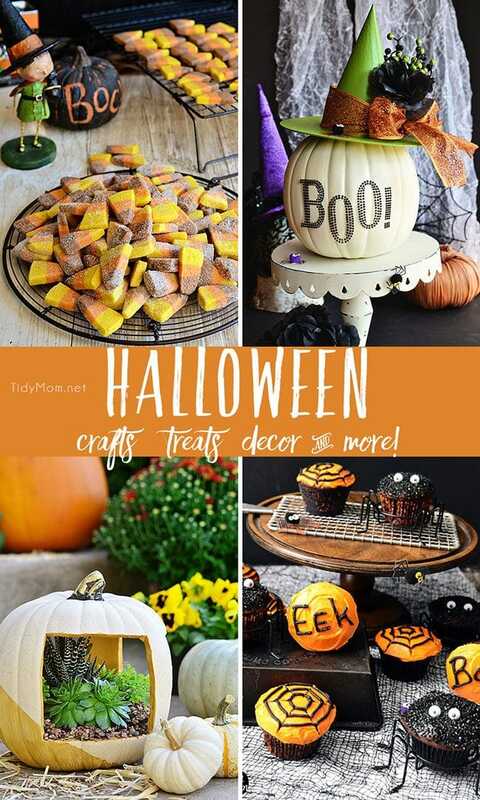 Halloween is one of my favorite holidays… the creative costumes, trick-or-treating, parties and of course the fun food! These easy Minty Fudge Vampire Brownies are sure to please the kids and adults alike. To get the ball rolling this year, I put on my festive halloween baking hat and made these Halloween brownies, idea courtesy of one Ms. Martha Stewart. 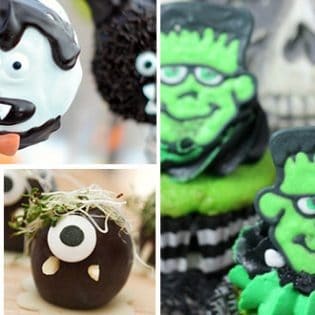 Halloween treats are so fun to make, whether you are whipping up Halloween cupcakes or getting ready for a Halloween party, the ideas are endless. As a Mom of two, now grown girls, I have made lots of fun Halloween food. I like to try to keep the food kid-friendly, not scary, and these brownies fit the bill! 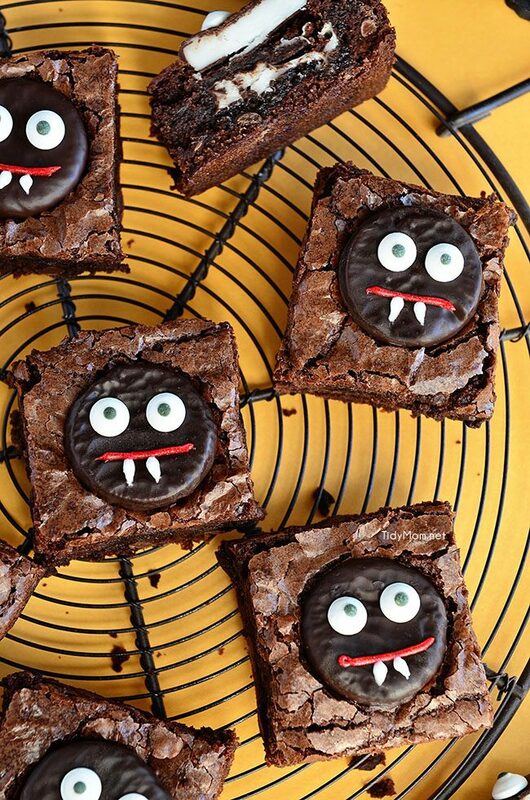 Ready to make your own Vampire Brownies? Read on! 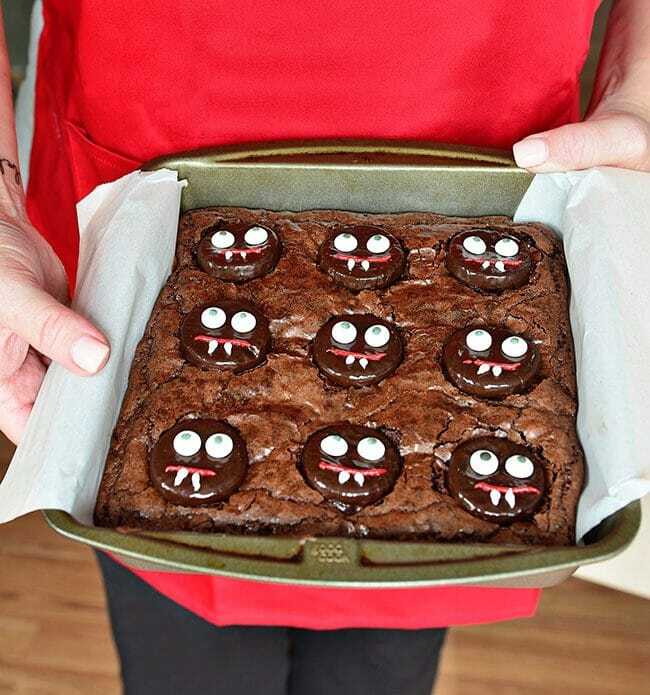 These Vampire Brownies start with your favorite brownie mix or recipe prepared and poured into an 8 or 9 inch square pan. Let the pan of brownies cool about 30 minutes on a wire rack, then top brownies with another 9-16 miniature chocolate peppermint patties. Let them cool another 15 minutes. Then decorate with candy eyes and icing. The chocolate on the peppermint patties will then be a little warm and soft, allowing the candy eyes to “glue” once they cool completely. Place decorated brownies in the fridge for about 20 minutes to set. Remove brownies from pan, cut and enjoy!! 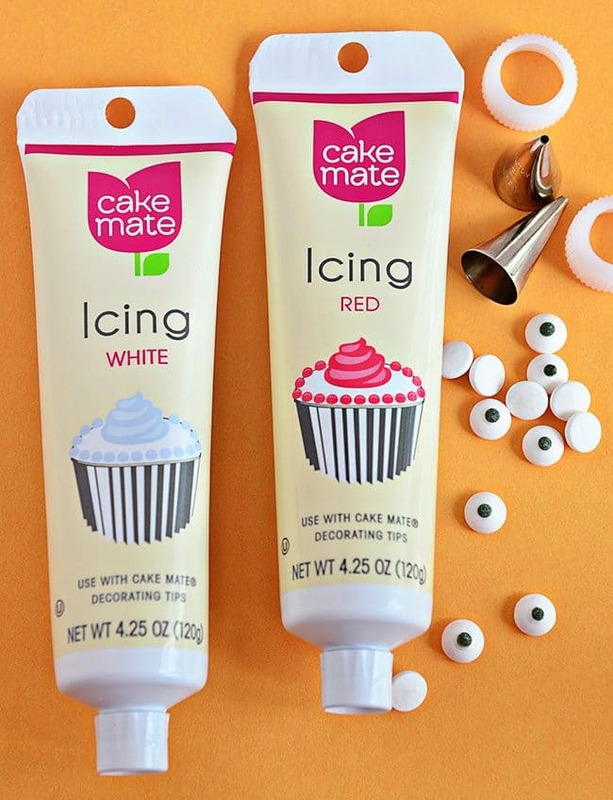 This is the icing I used for the mouth and fangs, although I did not buy their decorating tips. I assumed my tips would fit – they did not, but I made d0 by holding them onto the tube. It was a little messy and harder to work with, but since I only had 9 vampire faces to draw, it wasn’t too bad. But I would recommend the small pen like tubes, or if you get these, be sure to get the tips that they sell too. 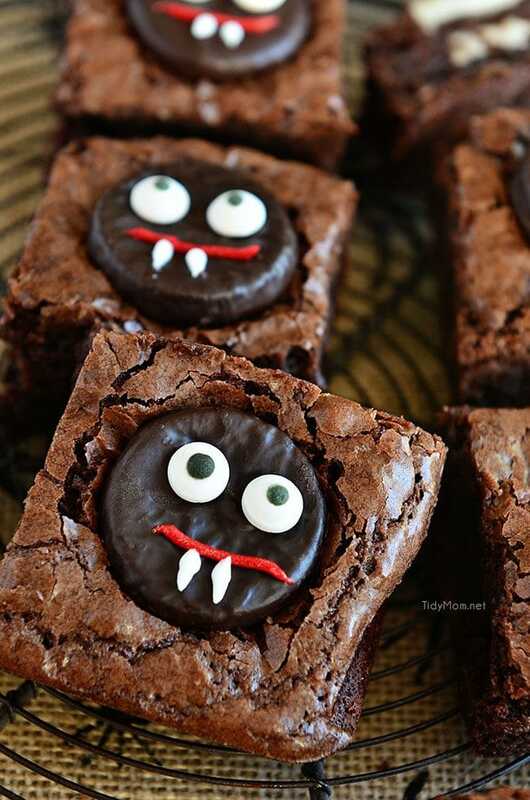 Serving these vampire brownies is perfect for a halloween party! Our family and friends got a kick out of them. 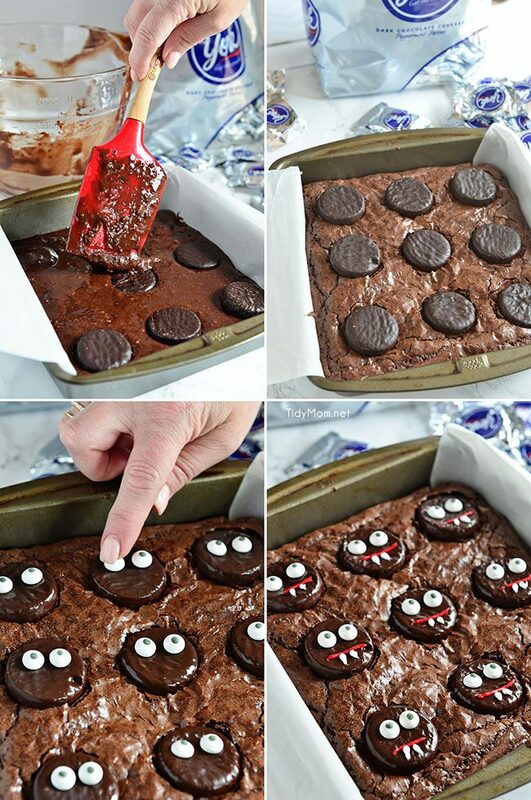 Don’t have kids, or no need for a vampire brownie? lol…………you cant beat peppermint patties + brownies. 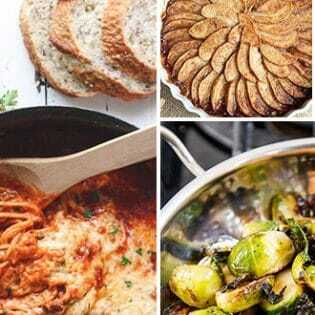 Make a batch, you wont be sorry! I hope you’ll have as much fun enjoying these brownies as we did! Plus I love, love, love mint + chocolate. Ok, I’m sharing this with my sister and all my mommy friends! OMG – Cheryl these are adorable! Now I’m really craving a Peppermint Patty. YUM!!!! These are freaking adorable, and so clever, I love them so much!! So fun! My grandson would love making these. These look super cute and easy to make! I think I will try them with peanut butter cups instead of the mint patties. Thanks for the idea!